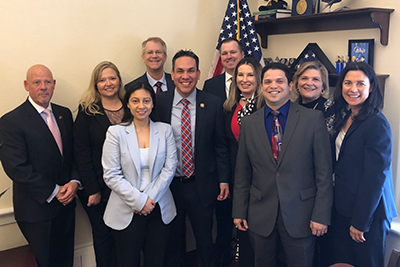 The three legs of credit union advocacy—grassroots, lobbying, and political organizing—were on full display as California and Nevada credit union leaders wrapped up the last phase of the Governmental Affairs Conference (GAC). The conference, hosted by the Credit Union National Association (CUNA), ran from Sunday, March 10 to Thursday, March 14, where 285 credit union staff and volunteers from both states traveled to Washinton, D.C. to be involved in one of the movement’s most important weeks of the year. The GAC demonstrated the strength of the CUNA/League credit union system as the California and Nevada Credit Union Leagues hosted its usual onsite meetings for members. On Monday (March 11), credit union advocates were briefed and prepared for their Tuesday meetings with officials from the Consumer Financial Protection Bureau (CFPB) and the National Credit Union Administration (NCUA); and on Wednesday, meetings with the California and Nevada congressional delegations took place. Credit union leaders from both states took their unified message to regulators and to Capitol Hill, discussing data and payments security (protecting members information), modernization of the Federal Credit Union Act (updating the charter for parity with banks), and the movement’s tax status—the foundation of its service to member-owners. Regulatory meetings covered topics ranging from pending rules to changes at both the CFPB and NCUA. Many credit union executives, staff and board members said it was one of the strongest and most highly engaging GACs they had ever attended, as everyone seemed motivated, enthusiastic and aligned. Members of Congress responded positively to the message of the credit union difference, which showcases the benefit of credit union membership. Along with California and Nevada, more than 5,000 additional credit union leaders attended the conference from all 50 states and Washington, D.C. Altogether, they conducted more than 600 meetings throughout the week with legislative and regulatory policymakers. For California, the focus has now shifted to state politics as the California League prepares to host its annual Government Relations Rally (GRR)! The state agenda includes discussions on cleaning up measures to the California Consumer Privacy Act, as well as a bill to allow local governments to create a public bank. Other issues and talking points are forthcoming as April approaches. Don’t miss out—get more information and register today!